Over the past three decades I have reviewed a number of Ian Tyson concerts, in addition to all of his new albums. He remains one of my favourite singer/songwriters. I’m old enough to have attended Ian and Sylvia concerts — first at Mariposa as headliners on Toronto Island in 1968 and then in concert at Alumni Hall, on the campus of the University of Western Ontario in my hometown of London. I have also had the pleasure of interviewing Tyson a couple of times from his ranch in the foothills of the Rocky Mountains. Tyson had the reputation of being something of an ornery subject, but once he sensed that he was talking to a reporter who had done his homework and was familiar with the music, the toughness evaporated and he became open, honest and gracious. Those who want a glimpse of the man and the artist behind the music can find it in a couple of memoirs — I Never Sold My Saddle, written with Colin Escott, one of Canada’s best music writers, and released in 1994, and The Long Trail, written with Jeremy Klaszaus and released in 2010 (see review below). Then there’s the autobiography Four Strong Winds: Ian and Sylvia, written by respected Canadian music critic John Einarson with the Tysons in 2011. It was shocking when Ian Tyson released Yellowhead to Yellowstone and Other Love Stories in 2008. His trademark machismo baritone was fried. One of the most distinctive voices in Canadian roots music for the last six decades had turned to dust. It was more than a little sad. That said, while a stubborn virus robbed Tyson’s voice of its rich resonance, the raspier, sand-paper timbre suited the songs on the album, an intimate, emotionally moving portrait of heartache and sorrow. Talk about turning vinegar into wine. It was artistic serendipity. The legendary Canadian singer/songwriter is back with Carnero Vaquero, his 13th album for venerable Stoney Plain Records. And, surprise, his warm baritone has returned, a phoenix rising from the ashes of a damaging throat infection. After 81 years on the range, Tyson hasn’t got the voice of his early years with Sylvia Fricker or subsequent stint hosting Nashville North on CTV, but it’s still a wonderful instrument, with the tinge of elegy. If only his old compadre Gordon Lightfoot could make such a claim. Again Tyson’s voice suits his material like a pair of weathered, leather, bronco gloves. Whether grieving lost love, breathing new life into a traditional ballad, paying homage to one of his heroes of the Old West, co-writing a song with his old buddy Tom Russell, reprising a ditty from an early Ian & Sylvia album or chronicling a vanishing cowboy culture, Tyson sings with grace, passion and eloquence. His is the voice of the Canadian West, despite such talented cowboy upstarts as Corb Lund. Despite the vocal trials and tribulations, one thing remains constant. Tyson is a helluva songwriter, on the strength of such songs as Will James, Shawnee, Chantell and Cottonwood Canyon, among others. Tyson has never been big on ornamental orchestration, preferring more of a chamber ensemble setting. Here he is joined by longtime touring guitarist Gord Maxwell, in addition to Lee Worden, Thom Moon and Catherine Marx. The album possesses the intimacy of being recorded in the Stone House, just down the gravel road from his ranch, south of Calgary in the foothills of the Rockies. 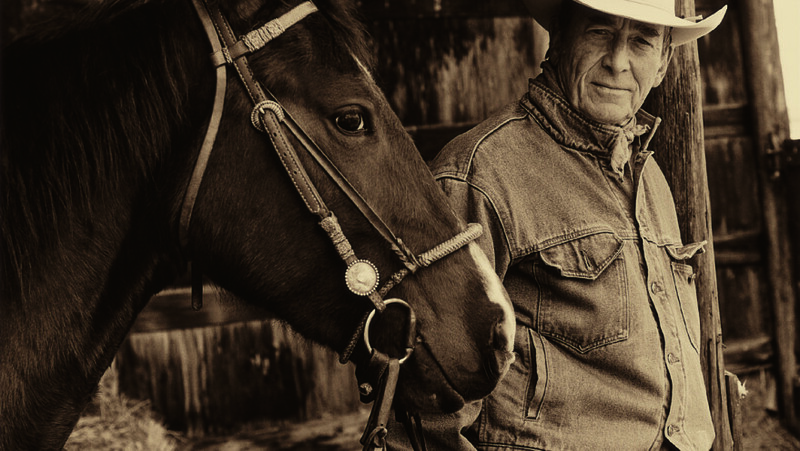 If you want to know what it was — or is — to be a cowboy on the range in Big Sky Country, Ian Tyson is your artist. With Carnero Vaqero he puts you in the saddle. Long may he ride. Anyone who has ever interviewed Ian Tyson knows the iconic Canadian singer/songwriter is a straight-shooter. He speaks his mind in accordance with the dictates of the world as he sees it. His candour would be less appealing were he not as honest accessing his own shortfalls and failures as both man and artist as he is at condemning others – even if he has mellowed as he celebrates his 77th year in the saddle. His thorny personality is the quality that makes The Long Trail (published by Random House) such an entertaining read. Subtitled My Life in the West, the slim, no-holds-barred memoir focuses on Tyson’s life since moving to Alberta in the late 1970s, which set the stage for his reinvention as a contemporary cowboy singer/songwriter. This doesn’t mean Tyson doesn’t touch on his childhood in British Columbia, his relationship with Sylvia Fricker which led to Ian & Sylvia, the birth of his son, the transition of Ian & Sylvia into seminal country rock artists with Great Speckled Bird, his divorce and second marriage and birth of his daughter. But it’s his thoughts about the vanishing West and its cowboy culture that have defined much of his life and shaped much of his music that justifies the book’s subtitle. The book traces some of the ground covered in Escott’s pictorial biography I Never Sold My Saddle, but this time the songwriter’s story is told in his own voice. Perhaps the most complementary thing I can say about The Long Trail is regretting that it’s so short. I could have ridden alongside the singing cowboy for many more miles. Check out the link below featuring Tyson paying heartfelt tribute to his father, a First World War veteran, with Four Strong Winds, one of the greatest songs ever written by a Canadian. He is joined by the Naden Band of the Royal Canadian Navy. Get your hanky or tissue ready.